The Zulip developer environment works well on remote virtual machines. This can be a good alternative for those with poor network connectivity or who have limited storage/memory on their local machines. We recommend giving the Zulip development environment its own virtual machine, running Ubuntu 14.04 or 16.04, with at least 2GB of memory. If the Zulip development environment will be the only thing running on the remote virtual machine, we recommend installing directly. Otherwise, we recommend the Vagrant method so you can easily uninstall if you need to. The best way to connect to your server is using the command line tool ssh. On macOS and Linux/UNIX, ssh is a part of Terminal. On Windows, ssh comes with Bash for Git. If you have poor internet connectivity, we recommend using Mosh as it is more reliable over slow or unreliable networks. 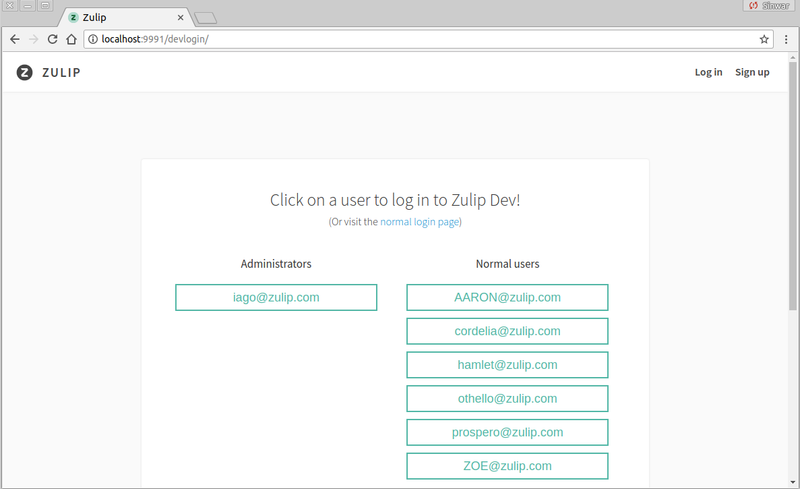 You will need a non-root user account with sudo privileges to setup the Zulip development environment. If you have one already, continue to the next section. 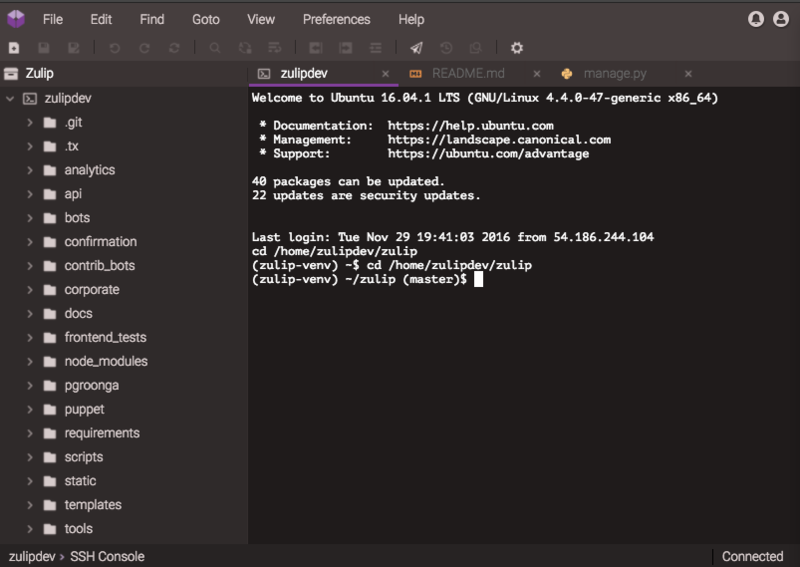 You can add the user to the sudo group by running the command usermod -aG sudo zulipdev. Finally, you can switch to the user by running the command su - zulipdev (or just login to that user using ssh). After you have connected to your remote server, you need to install the development environment. If the Zulip development environment will be the only thing running on the remote virtual machine, we recommend installing directly. Otherwise, we recommend the Vagrant method so you can easily uninstall if you need to. The main difference from the standard instructions is that for a remote development environment, you’ll need to run export EXTERNAL_HOST=<REMOTE_IP>:9991 in a shell before running run-dev.py (and see also the --interface='' option documented below). If your server has a static IP address, we recommend putting this command in ~/.bashrc, so you don’t need to remember to run it every time. This allows you to access Zulip running in your development environment using a browser on another host. The --interface='' option makes the Zulip development environment accessible from any IP address (in contrast with the much more secure default of only being accessible from localhost, which is great for developing on your laptop). Now you can access Zulip by navigating to http://127.0.0.1:3000 in your local computer’s browser. For more information, see Using the development environment. Edit locally: Clone Zulip code to your computer and then use your favorite editor to make changes. When you want to see changes on your remote Zulip development instance, sync with Git. Edit remotely: Edit code directly on your remote Zulip development instance using a Web-based IDE (recommended for beginners) or a command line editor. Next, follow our Git and GitHub Guide to clone and configure your fork of zulip on your local computer. Once you have cloned your code locally, you can get to work. The easiest way to see your changes on your remote development server is to push them to GitHub and them fetch and merge them from the remote server. For more detailed instructions about how to do this, see our Git & GitHub Guide. In brief, the steps are as follows. Open Terminal (macOS/Linux) or Git for BASH. Change directory to where you cloned Zulip (e.g. cd zulip). Use git add and git commit to stage and commit your changes (if you haven’t already). Push your commits to GitHub with git push origin branchname. Be sure to replace branchname with the name of your actual feature branch. In Terminal or Git BASH, connect to your remote development instance with ssh user@host. Change to the zulip directory (e.g., cd zulip). Fetch new commits from GitHub with git fetch origin. Change to the branch you want to work on with git checkout branchname. Merge the new commits into your branch with git merge origin/branchname. If you are relatively new to working on the command line, or just want to get started working quickly, we recommend web-based IDE Codeanywhere. Create a Codeanywhere account and log in. Create a new SFTP-SSH project. Use Public key for authentication. Click GET YOUR PUBLIC KEY to get the new public key that Codeanywhere generates when you create a new project. Add this public key to ~/.ssh/authorized_keys on your remote development instance. Once you’ve added the new public key to your remote development instance, click CONNECT. Another way to edit directly on the remote development server is with a command line text editor on the remote machine. Nano: A very simple, beginner-friendly editor. However, it lacks a lot of features useful for programming, such as syntax highlighting, so we only recommended it for quick edits to things like configuration files. Launch by running command nano <filename>. Exit by pressing control-X. Vim: A very powerful editor that can take a while to learn. Launch by running vim <filename>. Quit Vim by pressing escape, typing :q, and then pressing return. Vim comes with a program to learn it called vimtutor (just run that command to start it). For some applications (e.g. developing an OAuth2 integration for Facebook), you may need your Zulip development to have a valid SSL certificate. While run-dev.py doesn’t support that, you can do this with an nginx reverse proxy sitting in front of run-dev.py.. The following instructions assume you have a Zulip Droplet working and that the user is zulipdev; edit accordingly if the situation is different. Edit zproject/dev_settings.py to set EXTERNAL_URI_SCHEME = "https://", so that URLs served by the development environment will be HTTPS.